This is a player's guitar, not a museum piece, and we love it all the more for that! The perfect balance of visual beauty, sound, playability and value in a hand-crafted instrument that can be totally custom-spec'd. There's nothing to criticise about this guitar. Having reviewed a Macon and 96 last year, we felt it was time to check out another in Patrick James Eggle's ever-evolving line. Again, it's a 96, but this time employing more conventional guitar-building timbers than our previous example - swamp ash, maple (albeit roasted birdseye) and ebony - but boasting new finish ideas and a unique pickguard. The 96's outline is a tweaked version of Fullerton's finest: more streamlined and modern, but the influence is clear to see. "It's scaled down in size from a Strat," affirms Patrick. "It's designed to be more comfortable and ergonomic but without losing any of the classic appeal." and Pat's are chosen wisely. Our 96 is a mean-looking machine due to its open-pore matt black acrylic finish that deliberately lets the grain show through. The ash's natural figuring is 'limed' in white, to create a negative of what you'd expect on a natural finish with filled grain. "The limed effect is pore-filler applied over the colour coat and then wiped clean," Pat tells us, "before the clear top-coat is applied." It's rare to pore over a guitar looking for something to criticise - and fail miserably. The 96 hangs together brilliantly. Another striking feature is the patinated brass pickguard. be patinated. I can't tell you more about the process other than that it involves various chemicals and heat," says Pat. Whatever the process, it interacts with the brass to create beautiful swirls of colour; each guard is as unique as the timber from which your guitar is built. You could, of course, opt for traditional plastic should you prefer. The roasted maple neck looks warm and organic, the busy birdseye figuring enhanced by its oiled finish. Pickup and hardware-wise we're in classic 'Super-S' territory, with HSS layout and Patrick's upgraded black Gotoh vibrato bridge sporting titanium saddles and milled brass block. The tuners are locking Gotohs with black phenolic buttons. Eggle is a lover of Mojo pickups and here we have a matched set of scatter-wound Alnico magnet single coils and humbucker. A push-pull switch on the tone pot taps the 'bucker to boost the guitar's versatility via the five-way selector and master volume pot. Microscopic examination of fit and finish reveals not a single flaw. Eggle is clearly aiming for the perfect balance between aesthetics and playing experience. He's succeeded with the former, so what about the latter? Our neck's soft V profile and 305mm (12-inch) radius 'board are a player's dream. The oiled finish is fast and natural in the hand, while the tall-but-narrow frets and flattish playing surface brush off any style with which you attack it. Whether it's classic rock, modern blues or high-speed rock styles, the subtle approach or tone-wide vibrato and four-fret bends, it takes it all and never breaks a sweat. Sonically, it's a dream, too: before even plugging in people commented on its resonance - almost like it were alive in the hands. But it's through an amp that the 96 excels. Sampling all tones across the five-way, it's immediately apparent how well suited these pickups are to the build, and how beautifully balanced they are from one to the other. Even on full humbucking the bridge unit doesn't overpower, and when tapped it sounds like the bridge version of the other two - unlike some tapped humbuckers that can seem like the sonic version of the cuckoo in the nest. There's also the feeling of tonal transparency from the hardware; nothing impacts on the guitar's speaking voice other than the woods, pickups and strings. It's a thoroughly musical and fulfilling instrument to play. It's rare to pore over a guitar looking for something to criticise - and fail miserably. The 96 hangs together brilliantly, from its scaled-down body that fits the player so well, to the delightful oiled neck and flawless fret job, a set of sounds that are real and organic, and hardware that gets the job done without affecting tone or playability. 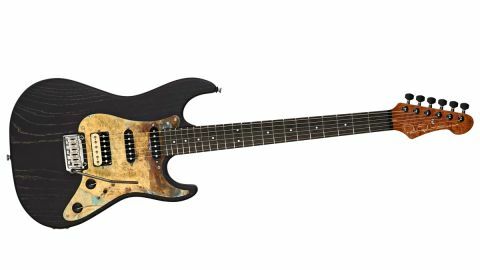 As it's crafted by a tiny team that's headed up by an acknowledged guitar nut with decades of design and building skill at his behest, the price of £2,795 seems almost paltry when compared with production-line instruments of comparable cost. And the fact that you can specify almost any facet of its construction means it's really a no-brainer to the serious player.